Voting in Diego Suarez (file photo). Madagascar is set for a run-off on 19 December after no presidential candidate amassed enough votes to be declared outright winner following elections held in early November. The run-off will be contested by two former presidents, Andry Rajoelina and Marc Ravalomanana who led first round presidential polls. According to provisional results announced by the National Independent Electoral Commission (CENI-T) on 17 November, Rajoelina and Ravalomanana emerged as the two candidates with the most votes in the first round elections, receiving 39.19 and 35.29 percent of the vote, respectively. Incumbent President, Hery Rajaonarimampianina, could only manage to secure 8.84 percent of the vote, according to CENI-T. The rest of the vote was split among 33 other presidential aspirants. The Madagascar Constitution requires that a presidential candidate must amass 50 percent-plus-one of total votes cast in a national election to be declared as president. The fact that neither Rajoelina nor Ravalomanana managed to garner the 50 percent-plus-one vote threshold has, therefore, necessitated the holding of a second round poll. The provisional results will now go to the Special Electoral Court for validation. The winner will replace Rajaonarimampianina who has been in power since winning the last elections held in December 2013. He also had to fight off the challenge of former health minister Jean-Louis Robinson after another inconclusive presidential poll that was held the previous month. Rajaonarimampianina replaced Rajoelina, a former disc jockey who had himself ousted Ravalomanana as president in a military-backed coup in 2009, in a similar method used by Ravalomanana to oust his own predecessor, Didier Ratsiraka. 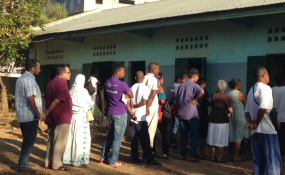 Voter turnout was high during the elections at about 54.3 percent of registered voters as the people of Madagascar chose among the 36 candidates for a president to lead them for the next five years. More than 9.9 million registered voters cast their ballots at nearly 25,000 polling stations across the country. A total of 24,852 polling stations were set up to facilitate smooth voting on Election Day. The election was endorsed as credible and fair by international and regional observers such as those from the Southern African Development Community (SADC) and the African Union. Head of the SADC Election Observer Mission (SEOM), Joseph Malanji said the voting process was generally peaceful and in accordance with the provisions of the Electoral Act despite concerns raised by some of the contestants. He said the SEOM observed that the elections were "conducted in an orderly and professional manner, and within the requirements of the legal framework of the Republic of Madagascar and further, in accordance with the revised SADC Principles and Guidelines Governing Democratic Elections (2015)." He commended the public media for providing prime time coverage to all political parties and the military for maintaining professionalism during the election period. The SEOM noted a number of other "good practices worth sustaining." "These include the calm and peaceful political and security environment before, during, and immediately after polling day and adherence to the laws and legal provisions governing presidential elections, particularly, the requirement that the incumbent President should resign 60 days before a presidential election if the incumbent desires to be a candidate in that election," said Malanji, who is Zambian Foreign Affairs Minister. SEOM made a number of key recommendations to further strengthen Madagascar's political systems. These include, among others, the need to revise legal provisions to hold harmonised elections; provision for continuous registration of voters by allowing this to be done throughout the year; intensified voter education for citizens; timely delivery of electoral materials; enforcement of the rules on election campaign finances; strong political party institutions and the need for the development, adoption and enforcement of an Electoral Code of Conduct for electoral stakeholders. The SEOM was made up of observers from Angola, Botswana, Democratic Republic of Congo, Lesotho, Malawi, Mozambique, Namibia, South Africa, Tanzania, Zambia and Zimbabwe. A total of 53 observers were deployed who covered 10 regions of Madagascar. SADC has been seized with the political situation in Madagascar since 2009 and appointed former Mozambican President Joaquim Chissano as special envoy to mediate in the peace talks. The conduct of the forthcoming presidential election in Madagascar should, therefore, be viewed in the context of these on-going regional initiatives that are designed to bring lasting political stability to the country. Read the original article on SANF. Copyright © 2018 Southern African News Features. All rights reserved. Distributed by AllAfrica Global Media (allAfrica.com). To contact the copyright holder directly for corrections — or for permission to republish or make other authorized use of this material, click here. Africa: Climate Change Talks - Are the Negotiations Beneficial to Africa?